CSS Manassas rams USS Brooklyn in the lower Mississippi River. And they made reference to the notion that the prisoners might be foreign mercenaries, the Daily Crescent warned citizens and military guard alike to be aware of the arrival of “Hessian prisoners” that were on their way to the city by train. As so often in the South, there was a fear of being overrun by foreigners. There also was a revival of community service in the area. There were festivals and fairs to raise money for families whose breadwinners were away in military service as well as for the less fortunate citizens. The city also began a free market. Public-spirited civilians made donations, the city provided operating funds and the market distributed food and other necessities to all eligible. The city regulated the system and issued tickets to “families and dependents of volunteers” who currently were in Confederate service or those whose had providers had died in service. New Orleans was functioning and making things work as well as possible, but the diaphanous demon that festered in the minds of merchants, business people as well as everyday citizens was the blockade. In the country’s major port a chokehold on trade stifled the normal spirit, the joie de vivre for which New Orleans was so well known. The hard fact was that the U.S. fleet was maintaining a close watch on the Head of the Passes at the mouth of the Mississippi. An enterprising group of businessmen, sparked by a former river captain raised the funds to purchase and convert a large, powerful tugboat into a warship. They had the boat covered with what took on the appearance of an armored turtle shell made of iron “T” train track rails. The locals readily applied the moniker, “The Turtle,” which immediately stuck. Its armor rendered it virtually impregnable and certain northern news organizations noted that it was going to be a terrible scourge once let loose on the American fleet. This was not to be. In command of the Confederate naval defenses was the elderly, but spirited, Commodore George N. Hollins. The Marylander had a distinguished career with the U.S. Navy beginning with his enlistment as a teenager during the War of 1812, and spanning a series of actions and promotions from the Barbary Coast of Africa to Central America. 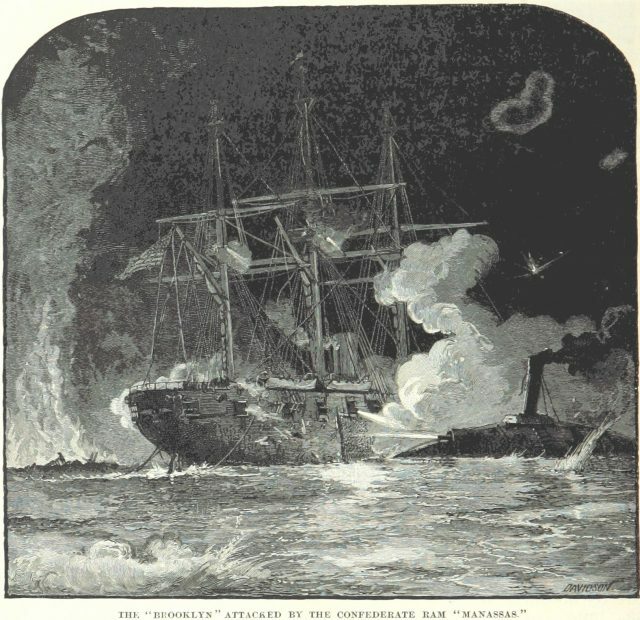 Hollins commandeered the Manassas, staffed the crew with volunteers from within his fleet and steamed downriver. Hollins had his squadron assembled and moving toward the passes and the Federal ships at midnight. The Union ships, commanded by Captain John Pope, who had served almost as long as Hollins, had the Confederates outgunned by more than double, fifty-five to little more than twenty. But Hollins did have the advantage of range and was able to surprise Pope. The surprise was a crash as the Manassas rammed the USS Richmond and left a five-inch hole in the hull below the water line. Before sunrise, Pope had his squadron in a retreat, withdrawing downriver toward the Southwest Pass.